Yesterday I visited four churches and a library – all on foot in the centre of Florence. Each contained great works of art by any measure of the word. The Medici Chapels contain those iconic tomb statures of Michelangelo – although he never finished the series, what we have are stunning. The San Lorenzo church next door boasts two – yes two – pulpits by Donatello. It made me wonder whether there were any dialogical sermons in the fifteenth century. I don’t think so… However, any preacher would need a good head for heights as the only way up seems to have been my means of a ladder. 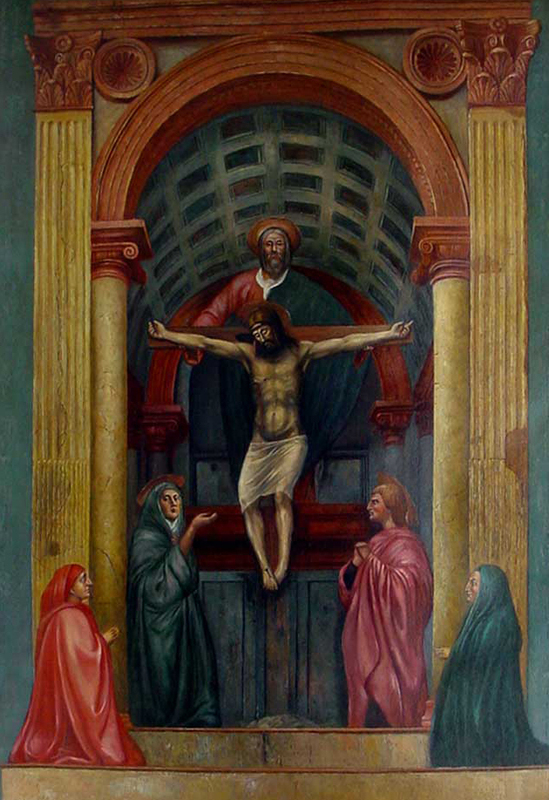 I particularly wanted to visit Santa Maria Novella to see one of the those paintings which were a turning pint of their era – in this case Masaccio’s portrayal of the Trinity. Here it was not so much spiritual death which attracted my attention as a sense of standing – yes – at a turning point. There are two remarkable features of this painting – and we have to remember that it was painted about 1428. First is the striking use of linear perspective – that ‘trick’ of drawing lines in such a way as a two-dimensional surface has the appearance of being three-dimensional. Apart from the technical stuff to help the artist, this procedure actually means painting what you see rather than what is there. So we ‘see’ railway tracks converging – so when we draw them like that they appear far more realistic than if we draw two parallel lines on the page. You paint what you see – not what you know – now there’s a thought for a future reflection! This approach to perspective was a discovery of the early Renaissance and although Masaccio was far from the first to use it, his Trinity is a stunning early example. But this fresco is also significant because of the realism of the figures and especially the faces. This is a long way from Giotto, father of Renaissance painting, beautiful as his paintings are. Here is a different kind of perspective ‘trick’ from manipulating of lines. Now the shading of forms, where light models shape, gives them a three-dimensional body on a two-dimensional surface. 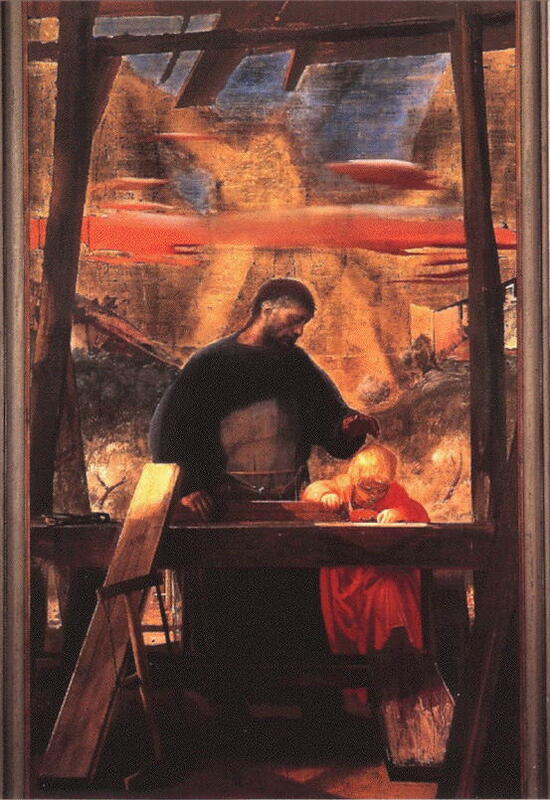 This technical developement, coupled with Masaccio’s humanity, results in human faces full of emotion and character. I have to admit that God the Father seems to be rather lacking in emotion – but that probably reflects the theology of the time! An exploration of scripture leads us to many places where images of emotion – anger, compassion etc – are attributed to God. But whatever the theology of God, we can recognize living, feeling, responding human beings in this fifteenth century masterpiece. I’ll leave the visit to the library for another day. These two images of Annigoni and Masaccio are taken off the web as neither church would allow photography, even without flash. 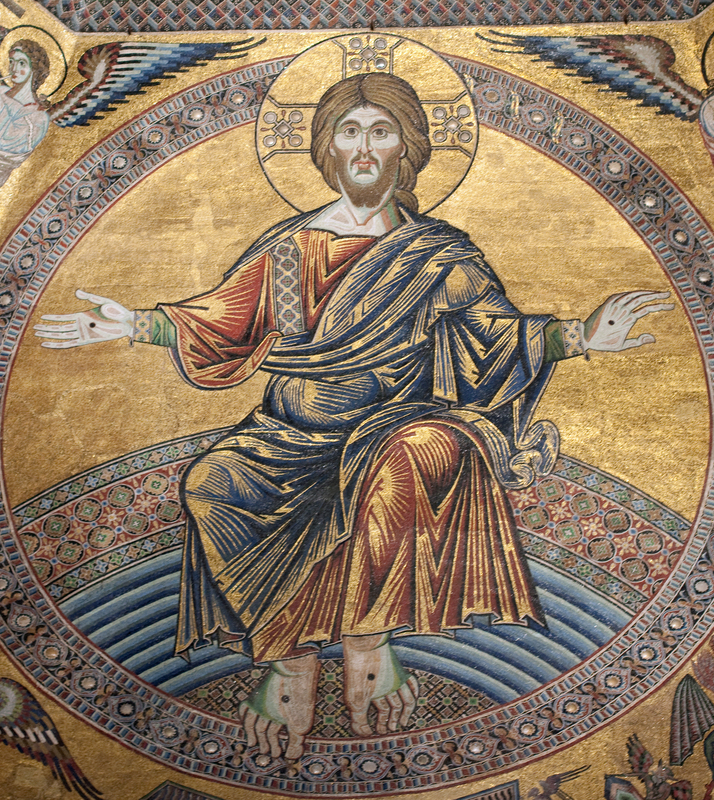 However, when I passed the baptistery next to the Duomo and found that there wasn’t a queue, I seized the opportunity and went in to see the medieval mosaics which cover the domed ceiling (I couldn’t find a font let alone a baptistery – but that’s another story). The dome is covered with scenes portraying the Last Judgement – and some of pretty scary. But the eye is inevitably drawn to Christ enthroned on the judgement seat. It wasn’t easy to see some of the detail from the ground as the mosaic of Christ must be 40-50 feet up, but when I had taken my photographs and inspected them on the laptop I saw very clearly the scars of the nails on his hands and feet. The one who judges is the one who has laid down his life for the redemption of the world. Whatever our views or expectations of the judgement are we must hold on to this central affirmation and hope – the judge is the one who has washed disciple’s feet, lifted fallen sinners out of the dust and died for our salvation. Images and phrases tumble after one another – Here is love vast as the ocean – the lamb that was slain sits on the throne – but especially: Kyrie eleison, Christe eleison, Kyrie eleison – Lord have mercy. this continues to be enthralling; I’ve never been to any of these places but they must get added to the wish list! After the recent ‘Rapture’ hoo-ha, your simple but profound reflection on the last judgement is a real word in season.